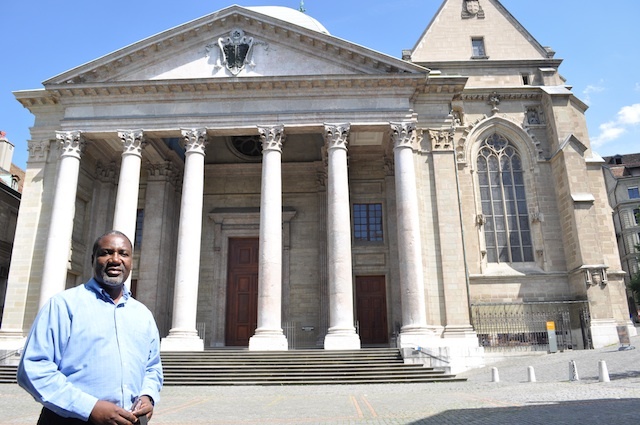 Two years ago, when I got an invitation to preach in Geneva, my chief regret was that I was fully booked for another two years. Thankfully, Pastor Larry Lloyd was willing to wait for the two years for me to preach at Crossroads Church. The intervening years took forever until finally last month my faith was turned to sight and I found myself in Geneva, Switzerland! What is so special about Geneva? It is the simple fact that this is where the famous John Calvin (1509-1564) laboured as a preacher and reformer in the 16th century. This was the city in which the worldwide Protestant Reformation received its greatest impetus. 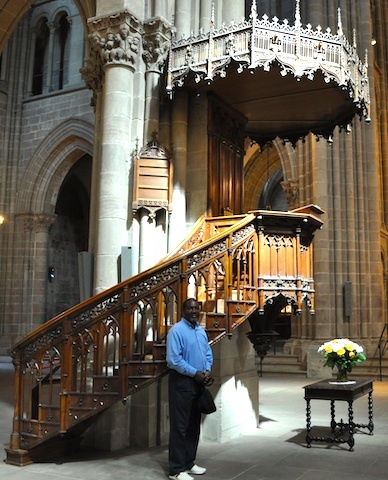 Although I was staying in Geneva, all my preaching took place in France. So, I can safely say that I followed in the footsteps of John Calvin, whose life was mainly lived in these two places. The theme I was given to preach on was “Spiritual Warfare” from the epistle of Paul to the Ephesians. The first five messages were at a church camp/conference just outside the town of Annecy. It was a beautiful quaint little town with the city centre itself being a major tourist attraction. 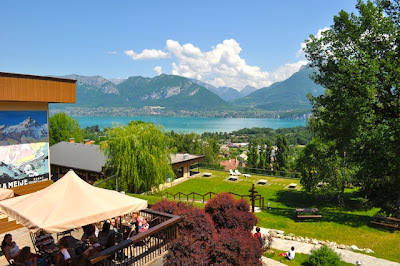 We were at a hotel from which you could see the cleanest lake in Europe (Lake Annecy) and its surrounding mountain range. For these messages I took verses where the Greek word “dunamis” is used in Ephesians and expounded them. Then after the weekend, I had two days to rest before I preached at the Crossroads Church itself on two successive evenings. For these messages, I expounded the famous Ephesians passage on the armour of God. It was during the two days of rest that Pastor Larry Lloyd took me to the Old City where the buildings that once made up Geneva in the days of John Calvin are located. It was an overwhelming experience to enter the buildings where this man preached and lectured, until he turned the whole city into a model of Protestantism, both in church and state. As we walked around I imagined which building it must have been where William Farel met Calvin and sought to persuade him to remain in Geneva and labour with him for the reformation of the city. It is said that Calvin used every excuse in the book to continue his journey—need for rest, love of study, desire to continue writing, etc. Then Farel rose from his seat, and, placing his hand on Calvin’s head, and fixing his eyes on him, he said, “Then God will curse your repose, and your studies, if in so dire a necessity as ours, you withdraw, and refuse to give your help and support.” That was how Calvin trembled and committed himself to staying in Geneva. That event alone changed the course of human history. 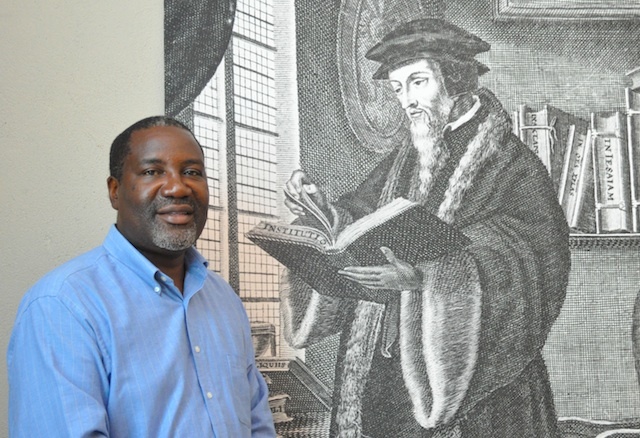 I recall that when I left university in 1984 to start work in a mining town called Mufulira, I decided to give my personal library the name “Geneva 1541”. Many young people, who made use of my library, often asked me what that meant. The answer was that it was in 1541 that John Calvin re-entered Geneva and laboured there up to the time of his death. The city council had expelled him from the city a few years earlier, together with William Farel, but had now invited him back. It was from that date onwards that Geneva underwent the sweeping reforms that turned it into the model city that it became. It was from this piece of history that I drew inspiration to enter Mufulira with a view to being a reformer. My dream was never to be realised. I only laboured there for three years and left to pastor the Kabwata Baptist Church. John Calvin is famous for his teaching on predestination and election. For some people that is all he ever taught. But that is like holding a door handle in your hands and mistaking it for the entire house! John Calvin’s genius lay in the way he was able to systematise the whole of Christian truth (especially in his Institutes of the Christian Religion) and also in the way he expounded the Word of God. Whenever I have gone to his commentaries on any passage of Scripture, I have come away wondering whether this man is living today. The commentaries are not only faithful to the text of Scripture but also rich in doctrine and plain common sense. 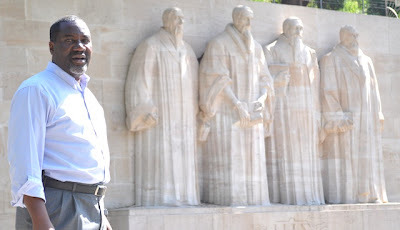 Although the statues of John Calvin, John Knox, William Farel, and Theodore Beza are still there in Geneva, sadly, the truths that these men love, preached, defended, and sought to apply in the life of this city-state are no longer known and loved by its populace today. The motto on their statues in Reformation Park reads, “Post Tenebras Lux” (“After darkness, light”). However, it seems that now it is, “After light, darkness.” For instance, my hosts warned me about an area right in the middle of the city where prostitution is legal. The state recognises this as a legitimate form of work, and the prostitutes are registered and pay taxes. I am sure this would make the great Reformer, John Calvin, turn in his grave! Praise God for the opportunity! Greetings, Brother Conrad, in the Name of our Lord, apart from Whom we can do nothing (John 15:5. )Hope you’ll take some time, please, to visit our Calvinist site, read some articles, listen to some radio shows, give me some feedback. We are Christians FIRST and not Republican Party cheerleaders. God bless you, your family, your work. PS -- And do tell me, please, your specific areas of interest so I might direct you to some helpful information. My desire is to equip saints to be effective in the spiritual war we are in, the war against the Christ, which, alas, in America, especially in the church, has never been more intense. For more than 40 years John Lofton has covered national politics and cultural/religious issues as a journalist, nationally-syndicated columnist, TV-radio commentator/analyst and political advisor. ----Editor, "Monday," the weekly, national publication of the Republican National Committee, 1970-73. --- Nationally-syndicated columnist for "United Features" Syndicate in more than 100 papers nationwide, 1973-80. --- Editor, "Battleline," monthly newsletter of The American Conservative Union, 1977-80. --- Editor, "Conservative Digest" magazine, 1980-82. --- Columnist, "The Washington Times" newspaper, 1982-89. --- Program-host/commentator, "America's Voice," a national cable TV network in all 50 states, 1998-99. --- A commentator on the "Mutual Radio Network;"
--- Author of a monthly column on the Federal bureaucracy for Howard Phillips' "Conservative Caucus." --- Has written articles for the NRA magazine “America’s First Freedom”; Gun Owners Of America. --- Communications Director for Constitution Party Presidential candidate Michael Anthony Peroutka in 2004. --- Editor, TheAmericanView.com web site. --- Co–host with Michael Peroutka of “The American View” radio program. John Lofton has given numerous speeches before various groups, Liberal and Conservative, including Liberty University/Bob Jones University. He has appeared on every major TV/radio talk show (including the Comedy Channel’s “Daily Show”/“Politically Incorrect”) to debate every imaginable kind of anti-Christian goofball --- and some who are unimaginable but who do, alas, exist. And he never went to college which is why he is so smart. He can be reached at: Email: JLof@aol.com. * Note, lest I be misunderstood: Being a Republican is not a disease; it is a choice – a very bad choice, but a choice nonetheless.